H.M. Armed Forces toys are an incredible new range of military inspired action figures and toys by Character Options. The action figures includes figures from each of the services - Army, Royal Navy and Royal Air Force. Plus the HM Armed Forces range will feature vehicles used by the services and realistic kit replica toys. In total there are over 40 toys in the range. All the action figures have closely detailed weaponry and clothing and are accurately modelled on actual troops in the field right now. The Army Infantryman action figure comes with an SA80A2 assault rifle, Personal Role Radio, Kevlar flak jacket body armour, Mark 4 Alpha kevlar ballistic protection helmet with standard-issue goggles and desert camouflage combats. The Royal Marine Commando figure is naturally kitted out with the acclaimed green beret. The Royal Air Force Fast Jet Pilot figure is in full flight gear including white leather flying gloves, 'bone dome' flying helmet with oxygen mask and survival-issue service pistol for use behind enemy lines. Accompanying the 10 inch figures are a range of authentic scaled troop carrying vehicles including a replica tank with spring-powered gun and space for two figures, armoured vehicles, RAF VTOL (Vertical Take Off & Landing) Fast Jet and a Royal Navy R/C assault hovercraft which travels over land and water. Other toys include essential forces kit items such as the exact replica two-way radios, a mini spy kit with tracking device and night vision goggles. HM Armed Forces Night Vision Goggles feature an authentic infrared image intensifier. The range also includes games as well as dress-up and role-play toys. The toys are designed and marketed under licence by the Character Group plc with a share of all profits going to the Ministry of Defence to be reinvested in other public relations activities, although the primary aim is to raise the profile of the Armed Forces. Character first broached the idea for the military figure range at a meeting with the MoD in February 2008. In a trading update (21st January 2009) Character Group stated that this new toy line has the potential to "fill the void caused by the current lack of authentic military-inspired toys in the action toy figure market". Character go on to state that they are "delighted to have worked with the Armed Forces and the MOD to create an inspirational range that portrays the correct ethos of its constituent services". The HM Armed Forces toy line harks back to the original Action Man figures made by US toy maker Hasbro which were first released in 1966, though finally discontinued in 1984. In fact the UK's Action Man range, made under licence by Palitoy, was preceded by Hasbro's very successful GI Joe line introduced in the US in 1964. Fans of the classic Action Man range will recall such notable highlights as the introduction of flock hair and beards in 1970, gripping rubber hands in 1973, swivelling 'Eagle Eyes' in 1976 and moulded blue underpants in 1979. 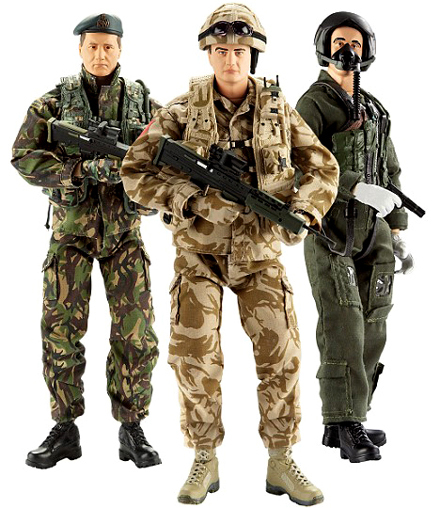 Now, Character's new range of HM Armed Forces action figures and toys, designed in consultation with senior military officials, promise and deliver a higher degree of accuracy and much greater attention to detail.